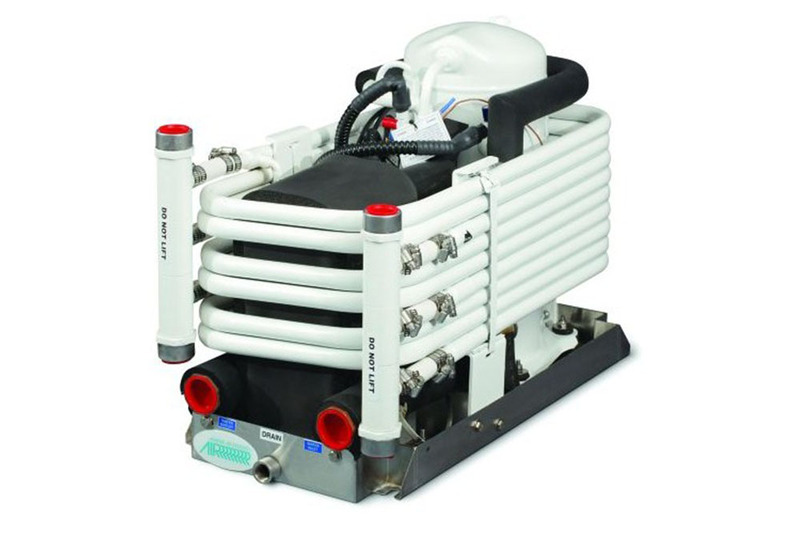 Marine Air MCG Low-Profile Chillers are designed for locations onboard where height is an obstacle. At a height of only 18.25 in. (464 mm) for 3- to 6-ton models and 25.2 in. (640 mm) for 12.5- and 15-ton models, MCGLP units are much shorter than other chillers in the same capacity range, but no shorter on performance and reliability. MCGLP chillers provide reverse-cycle cooling and heating and are available in capacities from 36,000 to 180,000 BTU/hr (3 to 15 tons). Individual modules can be staged for larger capacities. The MCGLP series uses R-410A environmentally safe refrigerant, which has exceptional thermodynamic properties and maximizes system efficiency.